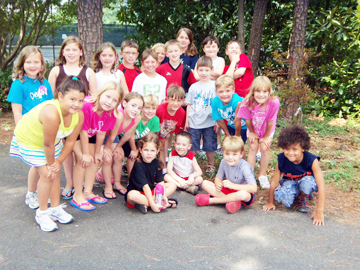 Pictured are the BWC July campers next to their new tree. Together they collected over 308 plastic bottles for recycling during their four-day camp. 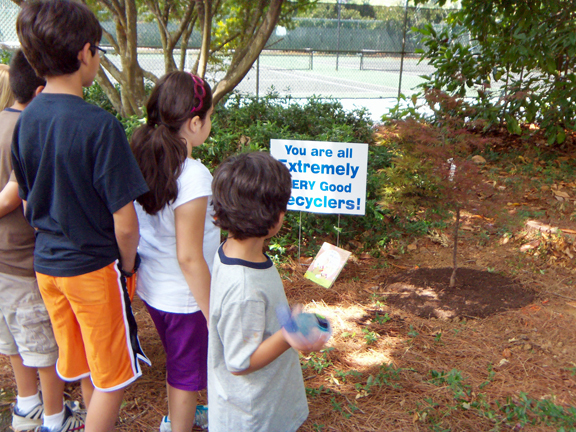 DALTON, GA – Camp participants at the Bradley Wellness Center in Dalton won their very own real tree for collecting more than 100 plastic bottles for recycling during their four-day camp this July. The Dalton Tree Board donated a Japanese Maple Red Dragon, which they planted near the tennis courts at the Bradley Wellness Center. It now joins the tree that previous campers won during the month of June for their recycling efforts. Liz Swafford, Recycling and Education Program Coordinator for the Dalton-Whitfield Solid Waste Authority, launched the summer recycling contest on the first day of camp with a showing of the children’s television show episode “Look After Your Planet”. The show is based on the book “We Are Extremely Very Good Recyclers” and features characters created by Lauren Child named Charlie and Lola. Campers learned about the importance of recycling and just like in the video received a Tree Counter poster they could use to keep track of how many plastic bottles they recycled. By the end of the camp participants had collected over 308 plastic bottles for recycling, filled up the tree counter, and earned their own tree. Pictured are the BWC June campers next to their new tree. Together they collected over 250 plastic bottles for recycling during their four-day camp. Campers see their group’s tree for the first time. The Dalton Tree Board donated a Japanese Maple Red Dragon and planted it along the walking track near the tennis courts at the Bradley Wellness Center. 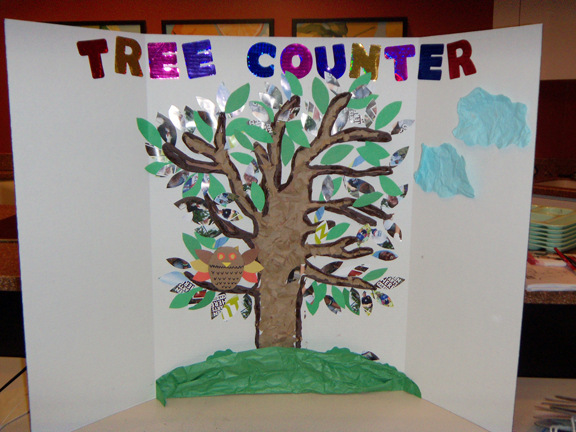 Pictured is the Tree Counter poster that the campers used to keep track of their recycling. Each leaf represents one plastic bottle. They exceeded their goal of collecting 100 plastic bottles during the four-day camp in June. DALTON, GA – Camp participants at the Bradley Wellness Center in Dalton won their very own real tree for collecting more than 100 plastic bottles for recycling during their four-day camp this June. The Dalton Tree Board donated a Japanese Maple Red Dragon, which they planted near the tennis courts at the Bradley Wellness Center. Liz Swafford, Recycling and Education Program Coordinator for the Dalton-Whitfield Solid Waste Authority, launched the summer recycling contest on the first day of camp with a reading of the book “We Are Extremely Very Good Recyclers” which features characters created by Lauren Child named Charlie and Lola. The group learned about the importance of recycling and just like in the book received a Tree Counter poster they could use to keep track of how many plastic bottles they recycled. By the end of the camp participants had collected over 250 plastic bottles for recycling, filled up the tree counter, and earned their own tree.